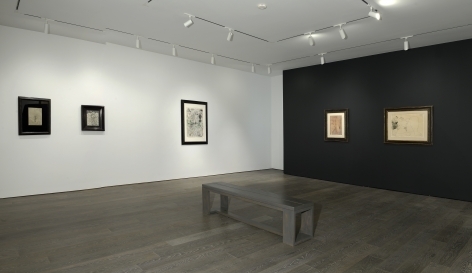 Van de Weghe is pleased to present an exhibition of works on paper by Jean-Michel Basquiat, Jean Dubuffet, and Pablo Picasso. 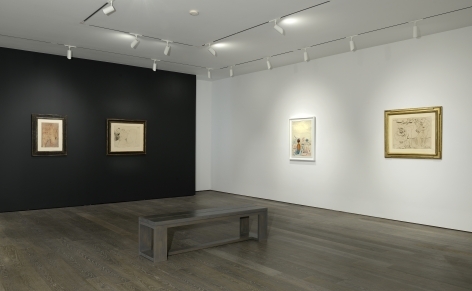 While grounded in figuration, the work of each of these three artists demonstrates a distinct improvisatory impulse reflecting their specifict concerns and preoccupations. Jean-Michel Basquiat (1960-1988) is among the most important American artists of the latter half of the 20th century. A self-taught East Village graffiti artist, he began his career circa1980 at the age of 19 and quickly became a superstar of the art world. His work is intensely charged on the one hand by strong color and gesture and on the other by a rich vocabulary of iconography and symbolism. Untitled, 1982, depicts a colorful, roughly drawn cast of characters positioned around a central figure looking subdued compared to the surrounding gaggle. Easy Mark Sucker – Coach, 1987 is a diagram-like drawing in colored pencil and graphite, incorporating hobo signs amid an arrangement of wheels, pulleys and cogs. Basquiat draws on the streetwise lexicon outside of the Modern canon to create a kind of swindler’s map. Jean Dubuffet (1901-1985) is best known for his invention of the term art brut to characterize work by untrained artists including psychiatric patients, prisoners and children. He felt that this work manifests a universal creative urge that culture and academia discourages with its reliance on reason and logic. 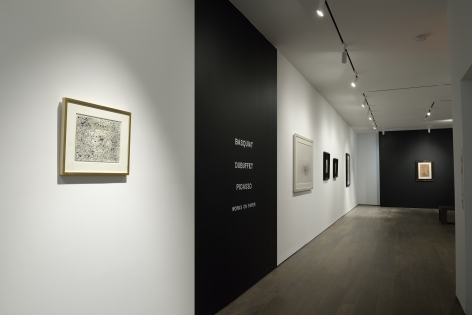 Dubuffet drew inspiration from these ideas for his own work, tapping into his primal and spiritual energies. In Corps de Dame,1950, the figure is positioned frontally on the page, arms splayed specimen-like, the flesh comprised of vigorous lines and hatch marks, while the figure in Personnage dans un paysage,1960 simultaneously emerges from and melds with the surrounding landscape comprised of dots, dashes and splatters of ink. Sol (Earth), 1960, dispenses with the figure all together in favor of the teeming energy of the micro landscape. Pablo Picasso (1881-1973), the father of Modernism, possessed a creativity of mythic proportion and was a master of nearly every genre. His line is distinctive and immediately recognizable in its fluidity and playful meandering. In Homme à l'agneau, mangeur de pastèque et flûtiste, 1967, each of the three figures is rendered in just a few lines, but Picasso is able to convey the relish with which the Bacchus eats and the wriggling of the sheep that is flung over a shoulder. While the reality of the figure is Picasso’s starting point, he is never chained to it. Nu couché, 1968 is characteristic of the erotically charged works he did late in life. He bends the figure to the will of the line, taking great liberties with the human form. 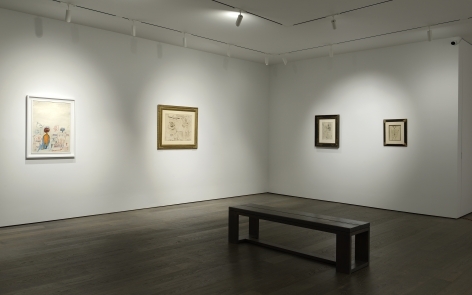 Though separated by time, distance, and circumstance, drawing existed for Basquiat, Dubuffet and Picasso as an important means of expression and experimentation in its own right. Their work has an immediacy and unselfconscious vitality that continues to resonate. Gallery hours are Monday-Friday, from 10:00am to 6:00pm, and by appointment. For further information, please contact Jenn Viola at jenn@vdwny.com.